Most Januarys Amber Magner is in the middle of the women’s basketball season trying to coach and mold her players into a winning team. Now a first-year doctoral teaching assistant at the United States Sports Academy, she will travel to Thailand to teach coaching to students there in the International Certification in Sports Coaching and Sports Management (ICSC and ICSM) program. A college basketball coach for more than 10 years and standout player at the University of New Orleans, Magner looks forward to her new assignment and the experience. It’s a step toward reaching her goal of furthering her career in sports management at the collegiate level. Magner’s course, Coaching Methodology, leads off the Sports Authority of Thailand’s (SAT) 2012 school year. The course is scheduled from Jan. 23-27. The Academy has a long-standing relationship with the SAT, sending instructors to Thailand to teach certification courses in the sports coaching and sports management programs. The SAT is Thailand’s primary sport organization and plays a vital role in the development of sport. For nearly four decades, the Academy has provided programs in sport education to students throughout the nation and to more than 60 countries across the globe. Magner, who is one of five students who began the Academy’s three-year residential doctoral program in September, holds a bachelor’s in business and master’s in sport management from New Orleans. 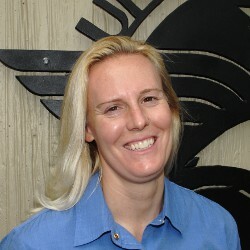 Previously, Magner coached women’s basketball for 10 years, including seven years as the head coach at California State University, Monterey. Magner led Cal State through the transition from NAIA to NCAA Division II. In addition, she taught foundations of coaching in the university’s Sports Management program and created, designed, implemented and ran the intramural program. As a player, Magner starred at New Orleans where she earned a Louisiana All-Academic Scholar Athlete Award and was named to the Sun Belt Conference Commissioner’s All-Academic Team three times. Already, Magner has planned activities for the Thailand students who will cover a wide-array of subjects, such as developing practice plans, pre-season and post-season training and a coaching philosophy. While there Magner hopes to have time to learn, too, about the country and culture.